Since the Financial Crisis, a combination of strong economic conditions, low interest rates, and healthy demand for credit has incentivized corporate borrowing. As firms have taken advantage of this environment, we’ve seen an increase in debt-funded merger and acquisition (M&A) activity, a development we expect to continue. Tempering this trend may be a decline in international dealmaking due to a stronger dollar and tariff-related concerns. In this piece, we discuss the motivation behind M&A and potential impacts of its recent pickup, as well as how our security selection skills can help us unlock the value in a transaction. Why Engage in Mergers & Acquisitions in the First Place? M&A activity is driven by a myriad of factors, such as a need to bolster stagnating organic revenues, diversify cash flows or geographic reach, or enter new markets. Firms that operate in slow-growing sectors may turn to M&A to boost top-line growth. Campbell’s Soup more than doubled leverage to make its $4.9 billion purchase of Snyder’s-Lance. Management hopes that the acquisition will offset declines in its core business by broadening its product offerings. M&A may also be used as a diversification tool or a way to enter new markets. Comcast’s bid for Sky, an overseas peer, provides geographical diversification. Amazon’s purchase of Whole Foods opened up a brick-and-mortar grocery business line, while Walmart’s deal with Flipkart established an e-commerce presence in India. 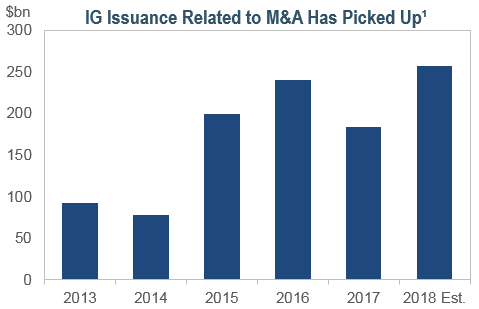 Entering 2018, some viewed regulatory uncertainty as an obstacle to prospective M&A, given the new administration and its Justice Department. Though Republicans are typically perceived as friendly to dealmakers, President Trump’s populist bent sent mixed signals to the market. These concerns were allayed when regulators gave initial approval to AT&T’s bid to acquire Time Warner. This decision may be viewed as a catalyst for continued dealmaking activity and M&A-related debt issuance. With this initial regulatory hurdle removed, we may see an acceleration of M&A transactions. Over the past decade, a healthy economic backdrop has led to substantial growth of lower-rated debt. 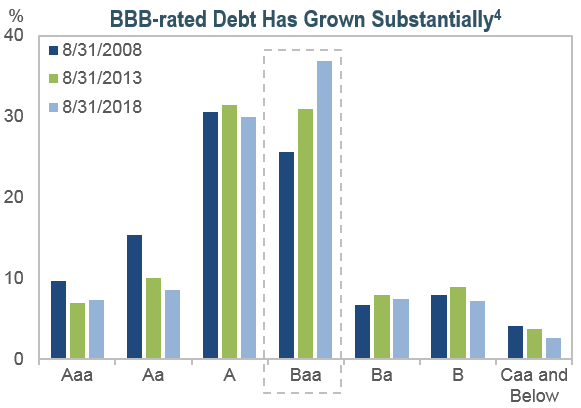 Within investment-grade bonds, BBB-rated debt now makes up close to 50% of the universe – ten years ago it comprised less than 35%.4 Further, BBB-rated debt has grown to nearly double the size of high-yield debt; ten years ago, they were a similar size. If the economy were to slow, a downgrade cycle could occur, potentially forcing widespread selling by passive investors and stressing the high-yield market. Additionally, some M&A deals could lead to concentrated exposure in certain sectors of the market. AT&T is already the second-largest issuer within the long investment-grade corporate index, at over 2.5%.4 Following its successful acquisition of TWX, the combined entity’s debt load may push its index weight above 3%, making it the top long corporate issuer, with $190 billion of debt.5 Sectors may become more concentrated, as well. Amazon grew from 14% to 30% of the consumer cyclical services sector after its debt issuance to purchase Whole Foods.6 Similarly, British American Tobacco, which had no index presence prior to engaging in M&A, grew to 27% of the tobacco sector following its acquisition of Reynolds American.6 We remain cognizant of the potential impact of M&A on index composition and the corporate universe overall. We believe that relying on synergies or cost savings to repay debt related to M&A is risky. 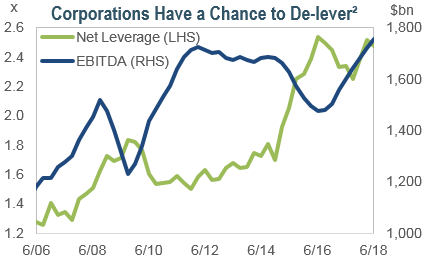 As such, we prefer to focus on deals that provide a clear path to deleveraging. We are underweight sectors where top-line stagnation may push companies to consider M&A in order to boost revenue, such as packaged foods and pharmaceuticals. 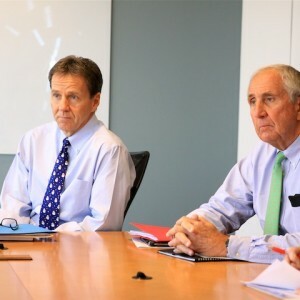 For example, we do not currently own Campbell’s, and are underweight Kraft-Heinz and Newell Brands due to concerns that one could become the next big name to engage in a transformative deal. Similarly, we are generally underweight the pharmaceutical sector as we feel there’s an elevated risk of debt-funded dealmaking. Conversely, we are overweight issuers that use M&A as an effective tool to build scale and/or add diversification, such as CVS Health. We believe that CVS Health’s acquisition of Aetna could transform the combined entity into an attractive business. The resulting large balance sheet could be offset by a diversified mix of revenue streams, which could generate more than enough cash to pay down debt and reduce leverage to pre-deal levels. 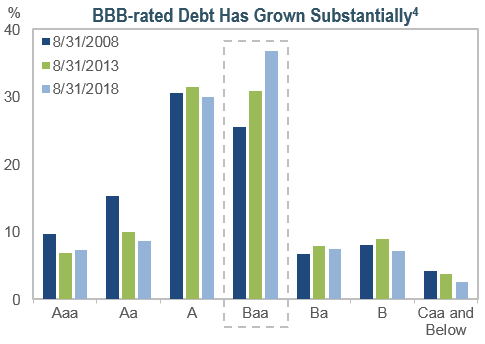 Healthy economic conditions have encouraged corporate borrowing, resulting in large balance sheets and rapid growth in the value of outstanding BBB-rated debt. As many companies consider engaging in mergers or making acquisitions, we feel that it is important to analyze and understand the deleveraging path for the combined entity. 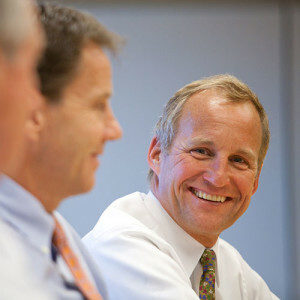 At IR+M, we are mindful of both the benefits and drawbacks of M&A. We rely on our bottom-up security selection skills to take advantage of deals that may add value strategically, and avoid ones that do not. ¹BofA Merrill Lynch Global Research and IR+M analytics as of 9/4/18. ²JPMorgan as of 9/21/18. ³IR+M analytics as of 9/24/18; examples are sorted by post-deal leverage. 4Bloomberg Barclays as of 8/31/18; chart depicts Bloomberg Barclays US Universal Credit Index; gray box highlights growth of BBB-rated debt. 5Bloomberg. 6Bloomberg Barclays, Barclays Research. The views contained in this report are those of IR+M and are based on information obtained by IR+M from sources that are believed to be reliable. This report is for informational purposes only and is not intended to provide specific advice, recommendations for, or projected returns of any particular IR+M product. No part of this material may be reproduced in any form, or referred to in any other publication, without express written permission from Income Research & Management.